Step 1 Trim any parts of ginger that are not firm and smooth. Slice into 1/4-inch thick pieces. Set aside. Trim root ends of green onions. Leave about 2 inches of green parts and cut white and green parts into thin slices. Set aside. Step 2 Combine soy sauce, Sherry and sugar in bowl. Set aside. Step 3Heat peanut oil in 12-inch nonstick skillet over medium-high heat. Hold palm of your hand 1 inch above oil; if you can feel heat, oil is ready. Add chicken and ginger pieces, spreading in single layer. Use a fork to move pieces occasionally so they don't stick to bottom of skillet. Brown chicken and ginger pieces, about 5 minutes each side. Step 4Reduce heat to medium-low and pour sauce evenly over chicken and ginger. Cover and cook until no pink remains around chicken bone (test for doneness by cutting a slit to the bone), 8 to 10 minutes. Step 5Remove chicken pieces and arrange on platter, sprinkled with green onions. Strain sauce and skim fat. Return sauce to skillet. Cook over medium heat, reducing by one-fourth, 2 to 3 minutes. Serve with chicken, if desired. 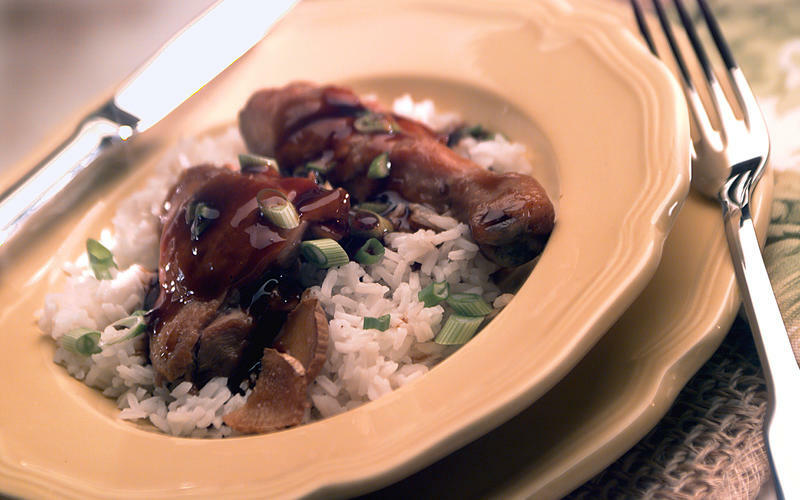 Accompany with jasmine rice. In Recipes-list.com we have selected the most viewed recipes from category - Main courses . Enjoy the best recipes specially selected for you! Chicken With Fresh Ginger is the right choice that will satisfy all your claims.